'Tis the season to try our hand at creating all sorts of holiday decor from simple paper. I've been saving up my favorites to share all at once, so... ready, set, make! Here's a step-by-step tutorial from Lisa Anne at Harmony Valley for a lovely star lantern made of painted and oiled watercolor paper... we're talking watercolor paints and vegetable oil - nothing complicated - which provides a nice translucency. A mantel grouping or a row of these down the center of a table would be beautiful! Perhaps you remember my German bell tutorial. I recently heard from Norm Riediger who has posted a handy how-to video on his Victoria Norman Home Blog for the same style bell. Norm's tutorial has a nice twist - not only do you get to see one being made, but you can print out a pretty green and gold scrolled version, ready to fold, using his template. Norm has also posted a template [no longer available]for a cute gingerbread house pop-up card. (And also a little cottage - what a nice housewarming card.) There's a video on the same page in which he shows us exactly how to make them. Norm's a good guy! 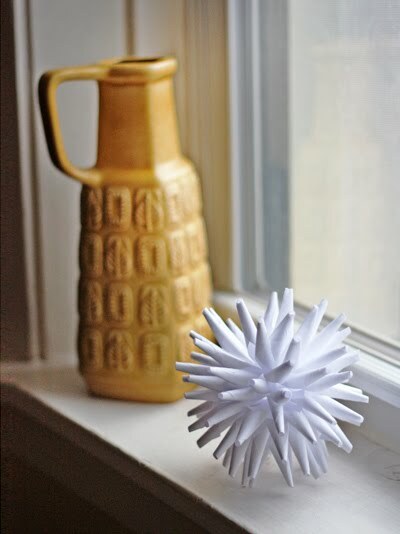 Another very cool idea is a Polish porcupine ornament. I was eying these on Etsy recently and - lo and behold - the very same day, Jessica Jones at How About Orange posted one of her always enjoyable tutorials. And thanks also to one of her commenters who linked to a great how-to video. Jeromina Juan has a blog filled with clever ideas... 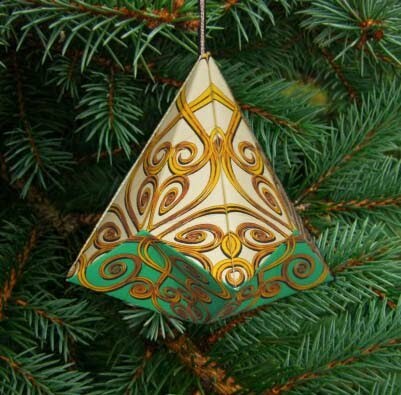 I love these chubby rolled paper ornaments she made that are trimmed with quilled scrolls. The full tutorial can be found at Paper Plate and Plane. And maybe you saw Jeromina's adorable Lego- Inspired Advent Calendar/Treat Boxes that were featured on Craftzine. As we're not terribly far into December, you can either (go crazy and) make one right away to catch up, or bookmark the page for next Christmas. Actually, spreading the task of punching a zillion holes over the course of a year might not be a bad idea.... your hands will thank you. The project is a pretty hefty amount of work, but what an impressive design! Last, but not least, here's a twirled snowflake ornament that would be beautiful as a tree topper or hung as a cluster on a mirror or window. Perhaps the snowflake looks familiar to you as it did to me... I've always put off making one of these because the twists and rolls give me brain freeze. This year I'm determined to give it a go, thanks to a link for a template and video, found via the blog of a chain of stores out west, Paper Zone. I daresay it actually looks much easier than I realized. Please hold me to my promise to make one, won't you?! All such clever ideas ! Thanks for the links to all the tutorials . love love love! 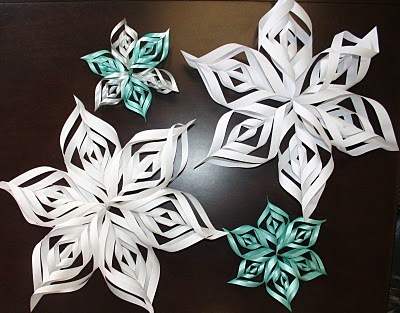 i'm TOTALLY making those snowflakes, we can make snowflakes together! ;) and that gingerbread house is adorable. such great ideas! Ann, you find the best projects! These are all amazing. Thanks so much for sharing! Wow, that's a lot of cool projects there. I need to get busy and try some of these out. These are wonderful! I've been thinking of making of a 3d x-mas tree with quilling paper but I don't think I have enough green! These were wonderful Ann! I didn't even get to throw on my clothes or get my first cup of tea before I was attempting one of those 3D Snowflake Ornaments! Just Awesome!